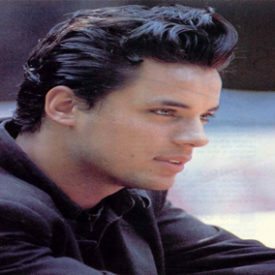 Nick Kamen is an English male model, songwriter and musician, and brother of session guitarist Chester Kamen and artist Barry Kamen. Nick attended St Marks RC Comprehensive School in Harlow along with his brother Chester. Kamen was first brought to the public’s attention in 1984 when Ray Petri featured him on the front cover of The Face. The cover showed him wearing a ski-hat, orange roll-neck sweater and aviator sunglasses. He is most remembered, in the UK, for his 1985 performance in Levi’s “Launderette” television commercial, where he strips down in order to stone-wash his blue jeans in a 1950s style public laundromat while he waits clad only in his boxer shorts, which was one of a series of Bartle Bogle Hegarty advertisements that dramatically increased the popularity of Levi 501s. It was selected for, and came fourth in, The 100 Greatest TV Ads of all time in 2000. His first single was the 1986 UK number five hit “Each Time You Break My Heart” from his eponymous début album. Written and produced by Madonna and Stephen Bray, it also cracked both the U.S. dance chart (remix by Shep Pettibone) and the Top 50 in Canada. Madonna also sang the backing vocals. Her original demo remains one of many unreleased Madonna songs. 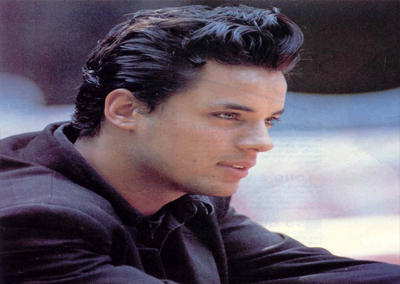 Kamen also had a #16 follow-up in the UK with the second single, Loving You Is Sweeter Than Ever, although his later singles were less-commercially successful in the UK but more so in the rest of Europe, particularly Italy, France, Germany and Spain. He appeared on UK television, singing, on Top of the Pops (12 March 1987 and 18 October 1990), This Morning (9 April 1990), Night Network (15 April 1987, 19 August 1987 and 1988) and The Tube (31 October 1986 and 21 November 1986). Kamen’s second album Us (1988) was produced by Patrick Leonard. Madonna again made an appearance as a backing vocalist on the song “Tell Me”, this time without contributing to the songwriting or production. In 1989 Kamen performed the song “Turn It Up” on the soundtrack to Walt Disney’s film, Honey, I Shrunk the Kids. 1990 saw the release of one of his biggest hits. The single “I Promised Myself”, from the album Move Until We Fly, reached Number 1 in eight European countries and was the fourth most played record in Europe in 1990. The song was later covered by Dead or Alive (1999), A-Teens (2004) and Basshunter (2009). In 1992 Kamen released his last album, Whatever, Whenever.